A ray of hope in the fight against cancer: Radiotherapy - the new building of the Institute of Oncology and Radiology in Belgrade. It sets the standard with state-of-the-art equipment and a room concept designed for patients. With the support of our experts in Belgrade, we provided 1200 m² of our acoustic solutions for the new clinic building. Up until mid-2018, Belgrade, the white city, faced an enormous challenge. Long waiting lists for modern cancer therapies were a burden and those affected in the Serbian capital were at serious risk of losing the fight against the insidious disease. The Ministry of Health of the country had to act and did so determinedly. It invested 17.9 million euros in four radiotherapy centres, including 8.9 million euros in the construction of a new radiotherapy clinic in the heart of Belgrade. Externally, the sober, single-storey clinic building with its white, no-frills façade shows no signs of the potential, which unfolds within. The commissioned planners Mašinoprojekt KOPRING from Belgrade paid special attention to these intrinsic values. "People who get cancer are on an emotional rollercoaster. They often have a long and exhausting journey either in front of them or behind them. It was therefore important to us that the spaces of Radiotherapy radiate safety and professionalism, while at the same time providing peace and a feeling of security," explains architect Jelena Nikolić. In the search for acoustic solutions that meet the high standards of hygiene in hospitals, the planners came across an option whilst talking with our experts, which opened new doors in interior design and perfectly matched the projects objectives. Dejan Popović, our Technical Advisor in Belgrade, introduced THERMATEX® Varioline SF motif to Jelena Nikolić. The 600 x 600 mm highly absorbing elements can be individually printed, enabling them to conjure colourful, large-scale motifs on modular ceilings. Thanks to special edge milling, the grid system is almost completely concealed, with only a narrow shadow gap, making the grid almost invisible. 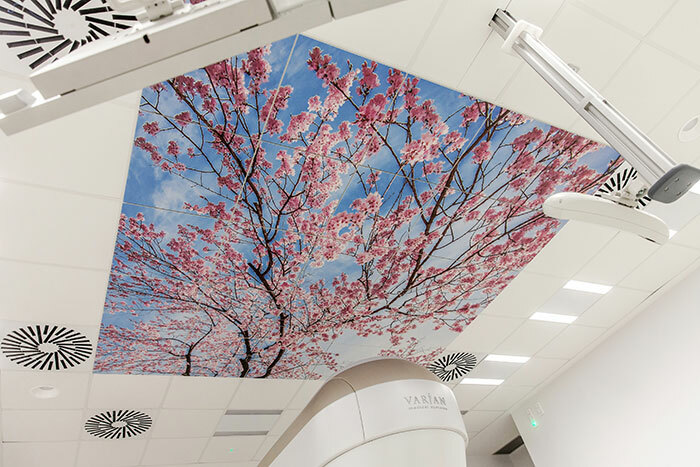 In Belgrade, the decision was made to use the motif ceiling tiles to place large-scale nature photographs precisely above the radiation equipment. The 3 x 3 metre images invite patients to immerse themselves and relax during the radiation therapy. The surrounding ceiling surface is made of sound-absorbing THERMATEX® Thermofon tiles whose special Hygena design prevents the spread of germs, bacteria and fungi on the surface of the tile. "In this area of application, the combination of function and design of our tiles is particularly beneficial," explains Dejan Popović. "The sound-absorbing properties of the tiles and soothing nature motifs help defuse the potentially tense atmosphere in the treatment room." Emphasis was not only placed on pleasant room acoustics in the treatment rooms. As soon as you enter Radiotherapy, a gentle calm is created that gives no impression of hectic or stress. To achieve this, large, oval TOPIQ® Sonic element ceiling rafts in the format 1200 x 1800 mm, effortlessly absorb the sound in the entrance area. The intelligent use of suitable tile types continues throughout the building. Various versions of our THERMATEX® mineral ceiling tiles play on their respective strengths in the different application areas. In the consultation rooms, they ensure that consultations and conversations can take place without annoying reverberation. In the corridors, they ensure pleasant tranquillity for patients. Wherever high levels of safety and hygiene are required, our THERMATEX® Thermaclean S mineral tiles can be found. They are also suitable for use in critical Zone 4 hazardous areas according to the strict French hospital standard NF S 90-351. They can be wet-cleaned and, moreover, are resistant to common disinfectants in everyday hospital use. For these special features, the tiles are factory coated with white vinyl film, which gives them both functionality and an elegant look. The new Radiotherapy with all its equipment and patient-oriented concept is a milestone for the city of Belgrade and the whole country. The aim of all participating doctors, nurses and political decision makers is to have no waiting lists for radiation therapies in the capital from 2018, thanks to the new facility. A first step has been taken - thanks to government investment in state-of-the-art Radiotherapy where the well-being of those affected plays an important role. Well-being that is promoted with the help of our unique acoustic solutions.